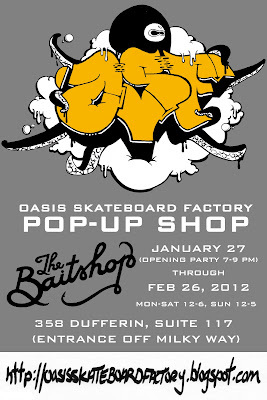 Come out and support the Oasis Skateboard Factory, Toronto’s first skateboard design and street art focused high school reengagement program. At the OSF students earn all their credits by running a community based entrepreneurial business where they learn hands-on to build skateboards, design original custom graphics, work with local artists and community partners, market and display their work and receive financial remuneration. 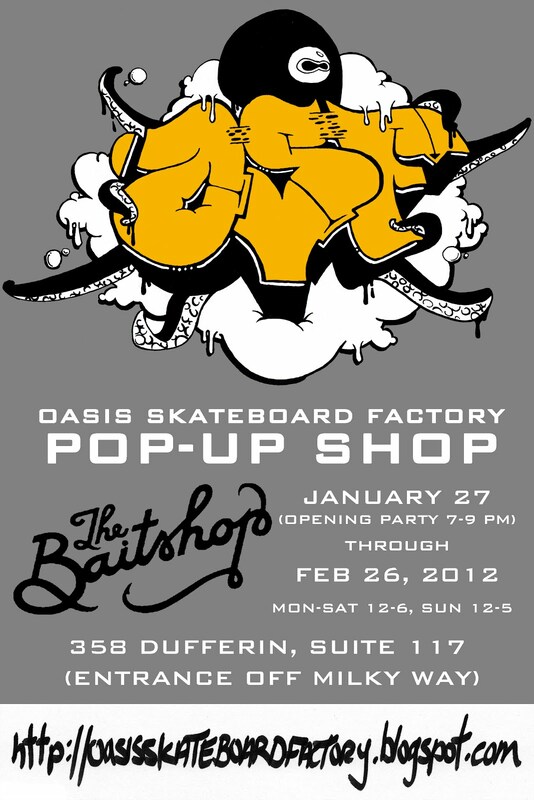 The OSF POP-UP SHOP is the culminating project in a semester-long business course developed by the OSF in partnership with The Baitshop, Toronto’s premiere screen-printing/skate shop and gallery. The innovative OSF/Baitshop Business Program is designed to help youth earn credits and develop transferable creative, employment and entrepreneurial skills. At the opening party students will be selling their hand-made skateboards and longbords with custom graphics, as well as having a sample sale of their street wear logo T-shirts to launch their personal company brands. To give back to the community, a portion of the sales of Oasis Skateboard Factory merchandise will be donated to a local charity. A stencil portrait of Jay Mandarino as a thank-you for the free skate days he gives OSF at CJ Skateboard Park! OSF Business Students pitch T-shirt brands to a panel of street-wear experts! Thanks to Steve at Well & Good and The Baitshop crew for all their feedback! I am 16 years old turning 17 this January. I have been attending Oasis Skateboard Factory for about a full semester now. Before this school I attended Northern Secondary School. At my old school I did not feel motivated as much as I do at this school. The work that we do at OSF actually goes somewhere and I really think that is a good feature to this school. My skateboard graphic is a monkey in the streets of Curious City ("curiosity"), the brand I have come up with. This monkey is spray painting a yellow hat with the stop sign logo on top of it. I wanted this to represent that the monkey wanted to be curious and say “screw the man in the yellow hat”. At the top of the deck the sky is an inverse pattern of skyscrapers. Some of my inspirations are Banksy, Neckface, and John Kenn. I really like each artist’s style and way of drawing, and the messages each of them puts out. The message I am trying to convey through this board is to always be curious in the city and to always looks and search out new skate spots to skate; don’t let anyone stop that creativity that you have, that everyone has. This board's 7 layers are made from 100% pure Canadian maple wood, pressed with a vacuum and whittled down by hand. I used 14 stencils for this board; it was sprayed with Montana and Belton paint sealed with a clear gloss. I am super stoked that this is the first board I have ever made; I don’t plan on riding it since it’s kind of memorabilia for me. I feel that I could have done a better job on the graphic if I spent more time but I am pretty happy with what I have accomplished. Overall this was a really cool experience and I hope to keep making boards in the future.